(to view the rest of this series go to Youtube and search for Claudia Borgna Beauty Parlor series). 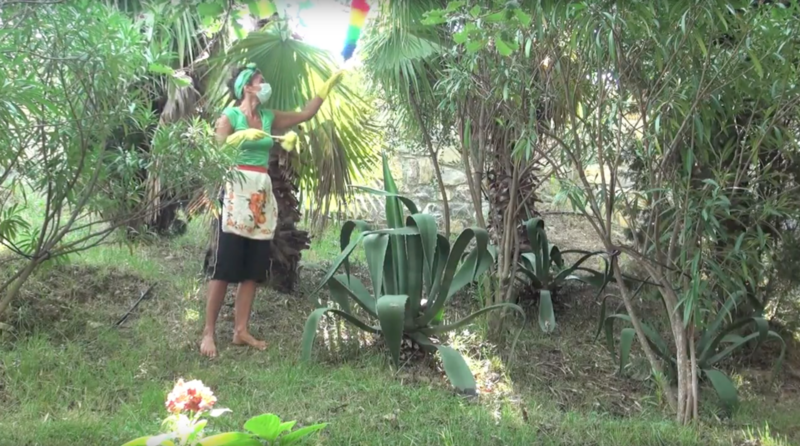 Description: This video is part of a series of several outdoor performances where the artists dusts and cleans plants and trees in various garden settings that took place in 2014 in Imperia – Italy, in Los Angeles as part of the VisionLA’15 Climate Arts Festival curated by Cheryl Slean, and in 2015 at BAM Festival at 18th Street Arts Center in Santa Monica, CA. These actions of care and maintenance are forms of poetic and political resistance. Inspired by “housewife” knowledge and by undervalued domestic labour, they are daily moments of sustainable creativity, or, of creative sustainability.